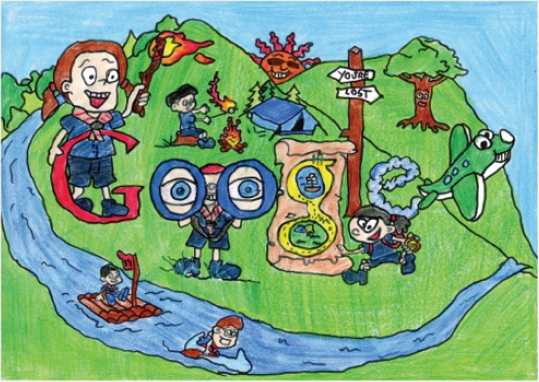 (Wexford/SCOUTING IRELAND) – Cub Scout Emma and her friends at 3rd Gorey Scout Group in Wexford, Ireland, were thrilled when news was made public yesterday that Emma’s drawing entry in this year’s “Doodle for Google Ireland” art competition had been short listed as one of 75 finalists among thousands entries. “I have lots of real adventures with my friends in Cub Scouts”, Emma wrote in her message accompanying her picture, saying that she had decided to show “things we do to try help raise awareness of Scouting in Ireland and all the fun things we do.” She added that she was looking forward to foreign trips with her Scout Group when she would have joined the Scout section. The notification that Emma’s drawing had made it to the final list was welcomed as a special birthday present by the whole Scout Group which celebrates it’s tenth anniversary this year after having reopened in 2004. And the competition is not over yet: Emma’s entry and 74 other finalists are now subject to public voting for one week. So, help Emma and the 3rd Gorey Scout Group become the winner and have “My Adventure as a Cub Scout” feature on every computer in the world one day during the year. Voting is simple: just click and select Emma’s picture. You can find it in group 3, the first on the second row. You will easily recognise the scarves!